Info: [ Phayul ] Kunchok Tsering, 18, passed away in his self-immolation protest today in Amchok region of Labrang, eastern Tibet. He carried out his protest near a mining site in the region, the same place where Tsering Dhondup, 35, father of three, passed away in his fiery protest on November 20. Kunchok Tsering, 18, died after setting himself ablaze today in Amchok region in Sangchu (Chinese: Xiahe) county, Kanlho (Chinese: Gannan) Tibetan Autonomous Prefecture in Gansu province (the Tibetan area of Amdo). 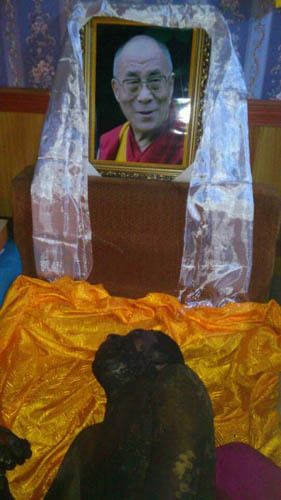 He burned himself at the same mining site where Tsering Dhondup died after his self-immolation last week on November 20. Amchok monastery monks and a large number of local Tibetans are known to have gathered at the deceased’s home to offer prayers. Kunchok Tsering is survived by his wife, Sangay Tso, 19 and parents Phagkyab, 40 and Gonpo Tso, 37, and an elder brother. DHARAMSHALA, November 26: In unrelenting reports of self-immolations coming out of Tibet, another Tibetan set himself on fire today in an apparent protest against China’s occupation of Tibet. Also today, over a thousand school students in Chabcha, eastern Tibet carried out a massive protest after local Chinese officials distributed papers denouncing Tibetan self-immolators and disrespecting Tibetan language. Chinese security personnel used violent force to break up the peaceful demonstrations, causing severe injuries to many students. Chinese authorities in the region have reacted by announcing a series of strict measures targeting the ongoing wave of self-immolations with further restrictions, punishments, and threats.